We often think of our poor old immune system when the colder winter months come around again, but our immune system needs recipes like this to give it a big boost all year ’round! It’s not just there to protect you from coughs, colds and the flu, it’s proper functioning is essential to your health, energy and vitality. It is constantly working to keep you energized. And it works so hard! It is constantly on-call, looking to seek out and recognize any pathogens like bacteria, viruses, parasites or fungi that have entered the body – and then get them out! It helps support the healthy bacteria in the gut, the workings of the lymphatic system and more – while also keeping a watchful eye on any of your body’s cells that have altered or mutated away from what they should be – and so is key to fighting cancer. This DELICIOUS immune boosting recipe (if I do say so myself) is a warming, healing, satisfying broth and does so much good to your immune system. Have it all-year-’round and either in a cup, or with a bowl and spoon. It is really quite yum. This recipe is SO easy and quick. Start by heating the coconut oil, filtered water, vegetable bouillon (stock), Bragg Liquid Aminos (or Gluten Free Tamari) in a pan and bring to a medium heat. Next add in the chopped ginger, garlic and chilli and let simmer for about 3-4 minutes. Finally, all you need to do is add the kale, spring onion, coriander and asparagus and let this simmer for another 3-4 minutes and then you’re ready to serve! When in the bowl, drizzle in a glug of olive or flax oil for an extra immune system boost. *note about chilli – vary this depending on your heat tolerance! You can add more, you can leave in the seeds, or go for one of those tiny, gnarly bird-eye chillis if you love it hot…OR…go for a bigger chilli and take out the seeds if you prefer less spice. But try not to leave out – the flavour of fresh chilli is important and the chilli is also very immune boosting. Other Cool Stuff Related to this Recipe! I’m often asked the difference between stock and bouillon as I use them both often in my recipes (you can find more of my free alkaline recipes here). The terms are almost interchangeable. Stock is slightly more intense in it’s flavour, especially if (unlike me, I’m vego) you are using meat stock cubes or bouillon powder. The bouillon powder or cubes (which are often also called broth powder) are just a little lighter. There are a couple of brands I use in Australia, one of which being Marigold. Now, it does contain Hydrolysed Vegetable Protein, which is often a code-word used in the industry to try to disguise MSG, but in this product (which is organic, vegan, yeast-free and gluten-free) it is only in the naturally occurring form from vegetables in the product. The actual amount of glutamate in the product is also tiny. If you were making a litre of the bouillon from powder (and this recipe calls for about 750ml – 3 cups) then it would have less glutamate than you’d find in a small potato. I always try to buy organic, but for some reason until a few years ago this hadn’t extended to my spice rack. 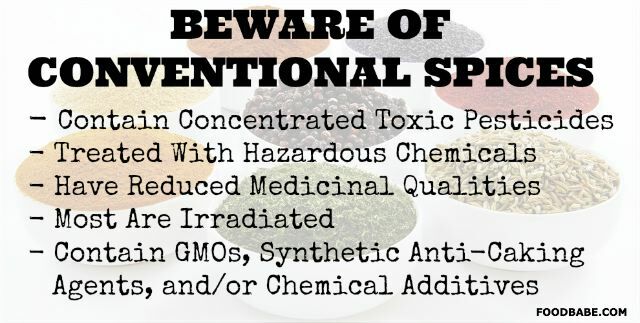 Then I saw this article from our friend Vani at Foodbabe.com and immediately threw all of my non-organic spices and dried herbs out and replaced them with organic. Expensive? A little. Worth it? OH ABSOLUTELY. To keep the cost down I recommend finding an organic whole foods store (such as the lovely Source Bulk Foods here in Australia) – this will help you buy quantities you’ll use within the time frame of them staying fresh – AND – it’s much more affordable. Arreola R, Quintero-Fabián S, López-Roa RI, Flores-Gutiérrez E, Reyes-Grajeda JP, Carrera-Quintanar L, Ortuño-Sahagún D. Immunomodulation and anti-inflammatory effects of garlic compounds. J Immunol Res. 2015;2015:401630. Josling P; Preventing the common cold with a garlic supplement: a double-blind, placebo-controlled survey. ; Adv Ther. 2001 Jul-Aug;18(4):189-93. Kiuchi F, et al. Inhibition of prostaglandin and leukotriene biosynthesis by gingerols and diarylheptanoids. Chem Pharm Bull 40 (1992):387-91. 1992. Nature Immunology Online. Nature Immunology Online. 2001;10.1038/ni732. 2001. Kyo E, Uda N, Kasuga S, Itakura Y. Immunomodulatory effects of aged garlic extract. J Nutr. 2001 Mar;131(3s):1075S-9S. Nantz MP, Rowe CA, Muller CE, Creasy RA, Stanilka JM, Percival SS. Supplementation with aged garlic extract improves both NK and γδ-T cell function and reduces the severity of cold and flu symptoms: a randomized, double-blind, placebo-controlled nutrition intervention. ; Clin Nutr. 2012 Jun;31(3):337-44. Note about chilli – vary this depending on your heat tolerance! You can add more, you can leave in the seeds, or go for one of those tiny, gnarly bird-eye chillis if you love it hot…OR…go for a bigger chilli and take out the seeds if you prefer less spice. But try not to leave out – the flavour of fresh chilli is important and the chilli is also very immune boosting. Just made this for dinner this evening and it was delicious! It was easy to make and the flavour was exactly what my soul was craving today! I can’t wait to have the leftovers tomorrow as I assume the flavours will ‘pop’ even more! Since I’m new to the alkaline lifestyle, I didn’t realize that some veggie bouillons had gluten and that was my only mistake…but at least it was organic! Great recipe – will make again and again! I have thought Braggs Liquid Aminos was MSG in a Bottle I use Nama Shoyu brand and WF Tamari. Hi Ross – we’ve already met via another post, another country or something to that effect. Thank you for your yummy soup suggestions – I intend to try them out right through this week. Please do inform people that chillies are nightshades, just in case, like me, someone is allergic/intolerant to them. Please continue with the good work! Can I freeze this broth?